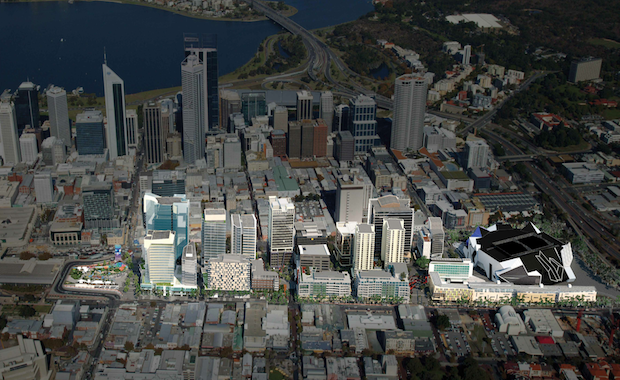 Perth City Link project that forms part of the Western Australian State Government’s vision to transform Perth. Western Australian Planning Minister John Day made the announcement today, which will see Leighton Properties and Mirvac sign the contract in 2014 for proposed master plan that will be part of the wider $5.2 billion Perth City Link project. The project will see the regeneration of the 13.5 hectare site, linking Perth’s Northbridge entertainment area with the CBD, through a mix of new bus and train transit, office and retail zones, public spaces and living environments. The redevelopment will play a key role in addressing Perth’s transport and infrastructure needs and will enhance a number of the inner city urban spaces including City Square, King’s Square, Queen’s Square and Milligan Bridge Plaza. Leighton Properties Managing Director, Mark Gray said the project will, ‘deliver a contemporary, integrated mixed-use environment accessible to locals and tourists alike”. The Perth City Link has the capacity to cater a residential population of 3,000 people, with 1,200 new apartments and will create 150,000sqm of office and retail space. Mirvac Chief Executive Officer, David Rolls said that the Perth City Link project will be one of Perth’s most significant CBD urban redevelopment projects. “The Perth City Link will revitalise Perth and is designed to reconnect and complement the surrounding areas whilst providing a seamless integration with the adjoining transport nodes”, said Mr Rolls. Major works form part of this project in preparation for the redevelopment including; relocating the Wellington Street Bus Station underground, completing construction of the Perth Arena and sinking a section of the Fremantle rail line from the Horseshoe Bridge to King/Lake Streets. This is the fifth joint venture between Leighton Properties and Mirvac Group. Construction of the project is anticipated to start in 2015.